Attendees will have opportunities to build skills, exchange knowledge, network, connect with thought leaders and influencers, and see firsthand how enterprises are leveraging SAFe to continuously deliver value to their customers. 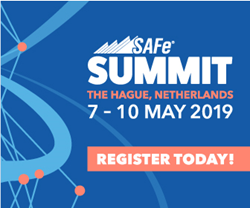 Scaled Agile, Inc., provider of the world’s leading framework for enterprise agility, today announced open registration for the 2019 European SAFe Summit which takes place May 7 – 10 at the World Forum in The Hague, Netherlands. The four-day event will be Europe’s largest gathering to focus exclusively on the Scaled Agile Framework® (SAFe) and its community of practice. The second annual European SAFe Summit is a ‘big tent’ event for everyone engaged with SAFe—practitioners, instructors, consultants, Scaled Agile Partners, and enterprise business leaders. The event will feature two days dedicated to Partners, pre-conference workshops, and a two-day main conference. Attendees will have opportunities to build skills, exchange knowledge, network, connect with thought leaders and influencers, and see firsthand how enterprises are leveraging SAFe to continuously deliver value to their customers. “The acceleration of SAFe adoption across the globe and the success of last year’s event is driving the evolution and growth of this conference,” said Dean Leffingwell, creator of SAFe and Chief Methodologist at Scaled Agile, Inc. “This year, we’re excited to focus on how organizations can fully master the Five Core Competencies of the Lean Enterprise to align their teams to a common vision and strategy and help them build the technical skills and work culture needed to adapt and innovate in today's unpredictable market. In addition, we’ll have a lot of new content based on ongoing SAFe development." Exclusively for Scaled Agile Partners, this two-day event is dedicated to building success in supporting and deploying SAFe products and services. The agenda features actionable, targeted content designed to help Partners deliver world-class customer results. For attendees seeking consulting, training, or platform solutions, Scaled Agile Partners will be exhibiting during the main conference, making this the only venue in Europe where an exclusively SAFe-focused audience can engage with vendors specializing in SAFe. Registration is open at europe.safesummit.com. Scaled Agile, Inc., is the provider of SAFe®, the world’s leading framework for enterprise agility. Through learning and certification, a global partner network, and a growing community of over 400,000 trained professionals, Scaled Agile helps enterprises build better systems, increase employee engagement, and improve business outcomes. Scaled Agile is a contributing member of the Pledge 1% corporate philanthropy and community service movement. Learn about Scaled Agile and SAFe at scaledagile.com and scaledagileframework.com.